If you see a blog post titled “10 Iconic Journalists Every J-Student Should Study” and want to share it, please consider what you’re attaching your name to on the interwebs. At the time of posting, more than 70 people have tweeted the link. That’s fine. Some, most or maybe all of them think it’s worth sharing. No problem there. But I’ve wondered since last night, when I first saw the link, if people realized what it was: linkbaiting. This type of linkbaiting is slimy and is meant to inflate the site’s PageRank. Of course we all want links to our sites. There’s nothing wrong with that. But do you want to be a party to this sort of practice? It’s gaming the web and devalues higher-quality content that receives links organically (somewhat related). We posted an article, " 10 Iconic Journalists Every JStudent Should Study” (http://www.onlinecolleges.net/2010/01/04/10-iconic-journalists-every-jstudent-should-study/), and I thought that you or your readers might find it appealing. I’ve received a few messages like this in the past and planned to disregard this one too. Judging by the approach and complete lack of personalization (that’s right, don’t even use my name in the note, which is probably submitted by some kind of script), I guessed that other journalism bloggers had received also it. Sure enough, I saw a few links to it on Twitter within minutes. Did they think it was linkbait? Come on, it looks fishy from onset. You probably wouldn’t open an email from Online Colleges, nor would you likely click such a textlink ad in your email program, so why would you want be a relay point for that promotion? 2. What’s on the site? 3. Does this content on this site seem out of place? Does a site called Online Colleges really care what journalism students study? No, they want you to use their service. Look at the other recent blog content. And the email sender was “savvy with their target group — journalists on Twitter — who will tweet and RT the hell out of the link,” as Daniel Petty said in a reply. It’s very smart of them to have authorititave people with strong reputations to generate buzz. 4. Who owns the site? Whenever this isn’t immediately clear on the about page or in the footer, you should be suspicious. Why don’t they list it? 5. Who owns the URL? OnlineColleges.net is registered to Stephanie Marchetti of Glen Ellyn, IL. Based on a search of her name and search of her email address, it looks as though she’s registered other similarly named domains, such as graduatedegree[dot]org, mbainfo[dot]com and eduers[dot]com. She owns a total of 51 domains, according to DomainTools.com. The registrant’s address is a home listed on Zillow (buy now!) and looks to be a nice 6-bed, 4.5-bath house on a 20,000-square-foot piece of property. After more searching, it looks like she’s married to Michael J. Marchetti, who Forbes and Business Week list as executive VP and COO of Dallas-based Tuesday Morning Corporation. What does all this mean? I don’t know. I wish I still had access to LexisNexis and Accurint. But now you have some more context. Note: I couldn’t find anything connecting her to the email address that sent the message to my blog. 6. Who has previously linked to the site? Search link:URL on Google (substitute the address for URL and make sure there’s no space between it and the link: search operator). 7. Who sent the link? 8. Is it a real person? The name sounded like a fake when I first saw the message, so I searched Amber Johnson, Amber Johnson + advertising, Amber Johnson + pr, Amber Johnson + Online Colleges, etc, etc. with no luck. I also searched that name with the registrants name — without success. 9. If it’s not a real person, who is it? The IP address links to a page with more details, which indicates the email bounced off a telecom company server in India. Not very helpful, but an important step in this investigation. As I did all this, I was chatting with Daniel Bachhuber on IM (Daniel aptly noted that someone might just be using that particular server to send the message; it might not be the actual computer from where it was sent) and posting a few key details to Twitter (read some of the discussion). I also searched “amber.johnson1983,” which gave me four results last night, including the one from the above search. Two results showed the same message I received and the other showed a similarly spammy request. It’s important to always open links before you retweet or share them online. It doesn’t hurt to check the short URL or text of a tweet or DM beforehand if it’s suspect. It’s also good to read, watch, listen to or in some other way consume the content on that page before you share (I’ll admit that I too could do a better job of fully consuming the content). You could also follow steps similar what I did with the “10 Iconic Journalists” post. Take away the source and context and the big question is, “Does this provide value?” Or, “Does this meaninfully add to the conversation?” Regardless of everything else, I knew from seeing the content that I found this post to have no real value. (OK, maybe just a tad in stirring comments of who should be on the list). Journalistics — I’ll admit that their blog is not without some value. But it doesn’t seem like people realize (nor note when linking to them) that they’re blog is meant to advance their product, which is similar to HARO. The piece that most reeks of linkbait? Best Schools for Journalism post. The post at least adds context that the results are based on the informal poll of 205 people and, without saying so, let’s you know how useless it is. Don’t take the linkbait. Whether it’s an unknown site that looks spammy or a big site trying to keep their traffic up throughout the day by posting new content with little value, you don’t want to be known as someone who falls for this and, by making the bait-layer successful, strengthening the practice. What’s the best etiquette? I think it’s ok to send someone a message such as, “Hey, I thought you’d be interested in this” or “I’d love your thoughts on this” and let the person do what they want. They’ll link it on their own if they like it. I’m more likely to not share a link if you ask just because I don’t want to open the door to more solicitations. For the newsy crowd, journalists shouldn’t include a source or a source’s information in a story without verifying who they are and what they’re motivation is, so why not do the same on Twitter? Sure, you don’t have to. But with all the noise and what I’ll call chaff-disguised-as-wheat online, why not — as a journalist — do your due diligence when sharing a link? And, sure, you may say a link or RT is not an endorsement, but it might still be perceived as such. It’s not simply about denying linkbaiters their pageviews and buzz marketing, it’s about your credibility and reputation as a trusted source of information. Moreover, verifying information or links you pass along is something everyone, not just journalists should do, no matter the medium. And, if you can’t verify it, provide the necessary context (more good reading on that topic). Link journalism makes context easy in stories online. But the link in itself is not necessarily journalism — it’s what you do to verify its source and accuracy that makes it journalism and, thus, more valuable. “Because it’s on the web” is no excuse for not verifying. That just leads to low-quality content, of which there’s plenty online. Instead, you should strive for the best quality because there’s so much garbage out there. Is this really providing value? Is this unique? Specifically, has it been tweeted a million and two times already? True, we all have different audiences and even having many overlapping followers doesn’t mean you should leave out the others who might not have seen it. We all need to be more discerning about what we share — and we need to know where it comes from. There’s plenty of linking, but I’d like to see more thinking along with it. Because we’re talking about links to lists, I’ll also say that all these of specific skills journalists need to have are all well and good, but the fundamentals are more important. Specifically, thinking critically and being skeptical. UPDATE (3:17 p.m.): A hilarious parody graphic of the iconic journos list from my buddy S.P. Sulllivan. UPDATE/BONUS LINK (4:50 p.m.): Craig Kanalley on how to verify a Tweet (h/t Ryan Sholin). Disclosure: I work for Publish2, a company that helps power link journalism. If you think this post is ironic considering the topic, I’d reply “nay.” The purpose of this post is to add value and it is clear who I am, what I’m doing and where I’m coming from. I appreciate links, but I don’t solicit them. One of my fellow former fellows asked our pcf09 Google Group about social media, singling me out near the end of her message. After I wrote this response (sent 6:33 p.m. CT), I thought “sharing is caring,” so here you go! Whoa, I kinda feel on the spot. Well, um… I’m going to cop out and defer to some smarter people/sites/articles except to say that I think some of the most important things to understand, for this group of already amazing storytellers and journalists, are the fundamentals of what’s changed/how things continue to change in news/media/journalism and everything related to engagement. Challenge your assumptions about how things have been done and should be done and always try to step back and think outside the conventional MSM wisdom. 1. I’ve been compiling a heapin-o-links. Disregard the guidelines part — it’s basically links for online engagement as it relates or can relate to journalism. 4. I’ve been slowly consuming Here Comes Everbody by Clay Shirky, another brilliant guy (see Newspapers and Thinking the Unthinkable). Not for lack of interest, just the opposite actually. My approach has been to read a section or chapter or two at a time, usually before bed. That let’s the ideas marinate and gives me more time to think on the details and take more away from it, versus speed-reading more for the big concepts. 5. Next up on my list is What Would Google Do by Jeff Jarvis. 7. I want to start paying a different kind of attention to the tech industry, specifically hows and whys as opposed to “oooh, that’s a cool shiny new toy.” Journalism is becoming much more like it as the two overlap more and more. Everyone, please share any of your favorite links, read, listens, etc.! Should a Social Media Editor Use Social Media? (Mashable) — her reply is in the comment section and she has since become active again. One reason may be so it fits into the traditional print lexicon; thus, it’s easier to understand what that person does because the term sounds familiar. This isn’t horrible, but it’s framing the position in the wrong mindset. Instead, this position should be established outside the context of any medium. Neither this role nor the person in it should assume the title and implied limitations of a comparable leadership position. Whoever leads social media at a news org should lead it for all platforms. And one manner that’s often forgotten is (brace yourself) human interaction. I’d recommend reading the other responses, which you can follow and respond to with the hashtag #smed. 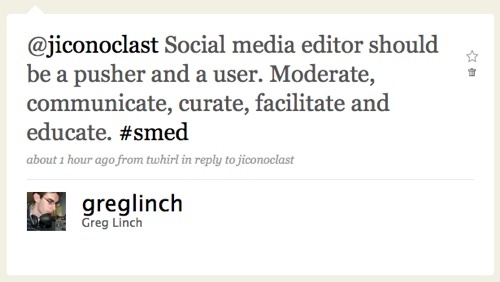 How would you define the role of a social media editor? Should a Social Media Editor Use Social Media? I’m at it again: Aggregating tweets from a conference I’m not attending or able to follow during work hours (this time Personal Democracy Forum 2009). This one is pulling in all the tweets that include pdf09. UPDATE: The chat is now embedded below. How Do I Help Students Handle Information Overload on Social Media Sites? The URL is simple and easy to remember (and tweet! ), so please share the link with others! Also, please come ready with questions and/or ready to help answer others’ questions. If you are not able to follow the chat live, you can submit questions beforehand by commenting below or contacting me on Twitter. I’ll be co-leading the discussion with Poynter’s Sara Quinn, a visual journalism faculty member who oversees the Poynter College Fellowship, which I attended in late May. Mallary Tenore invited me to help with this chat, and I thank her for the opportunity. She’s awesome. If you don’t read her blog or follow her, you should. I’d also like to thank Ellyn Angelotti, Poynter’s interactivity editor, who you should also follow. Some background: While at #pcf09, some other fellows and I joined a live chat led by Emily Ingram. Ellyn said if I pitched a good idea, I could lead one too. I mentioned the topic of effectively using various social networks, which soon became this topic. Voila!